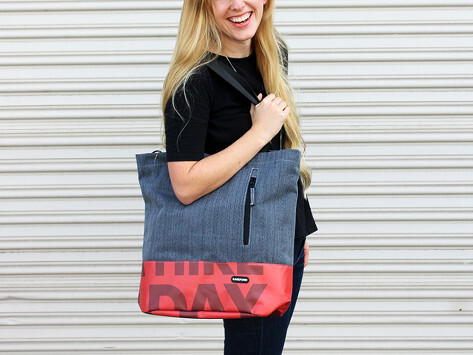 This upcycled classic tote draws attention and stands up to the elements. Every single model is unique. RAREFORM gives freeway billboards new life, hand-cutting the vinyl and heathered body fabric to create a bold, durable, eco-friendly bag. 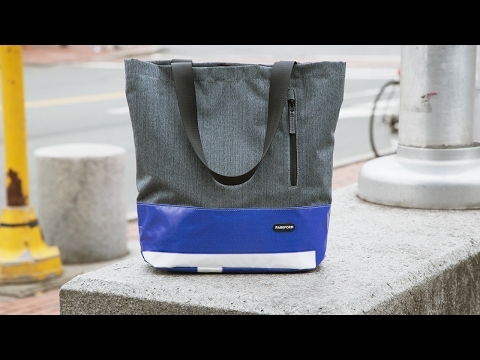 This tote comes with a removable shoulder strap and a padded laptop sleeve. It also opens up super wide for easy packing. Great for a carry on our carry about! Get lots of compliments, its lightly padded, great pockets. DEFINITELY RECOMMEND! I love this tote. Nicely finished and holds m laptop securely. Great bag. I was a little disappointed that my tote did not look very unique. It's the luck of the pick I know. Having said that, this tote is very functional. It has a great cushioned pocket for my IPad, kept it protected when traveling. There is lots of room for all my stuff. Get all the attention of a billboard in a distinct, sophisticated, and sustainable design.